Both Irvin and his wife Betty are ninety this year. Fidelio extends to the mutual act of professional commitment that this inseparable couple have displayed over the decades. Then there is the fidelity which the artist has shown his gallery, as we celebrate 30 years of working together. Accompanying the exhibition is a fully illustrated catalogue with a text by Paul Moorhouse. 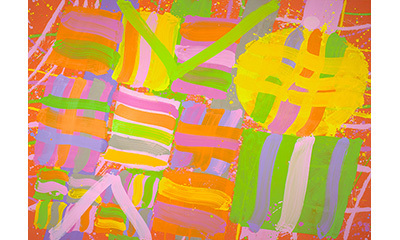 Albert Irvin RA was born in 1922 in London, where he continues to live and work. In the early 1940's, Irvin attended Northampton School of Art. His studies were interrupted when he was called up, serving as a navigator in the Royal Air Force during the war. After being discharged, he enrolled at Goldsmiths College in London. Much later, in 1962, Irvin returned to Goldsmiths, where he taught for twenty years. Irvin has exhibited extensively throughout Europe and in Australia. His works are in many public collections, including The Art Gallery of New South Wales in Sydney; the British Council; Irish Museum of Modern Art, Dublin; Manchester City Art Gallery; Tate Gallery and the Victoria and Albert Museum, London.